This is how to whip up a yummy no-bake cheesecake. 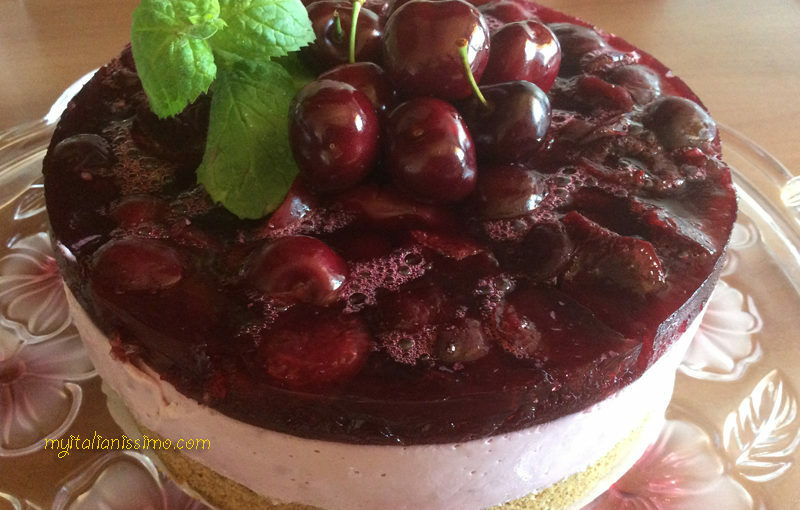 Fresh cherries, a crunchy biscuit base and smooth cream cheese filling make a delicious summer dessert. Crush the biscuits and mix in the butter (melted at room temperature), line the base of a 18 cm round springform tin with greaseproof paper, and push the biscuit mixture into an even layer into the base of the tin. Chill for 15 min. Soak 8 g gelatin sheets in a bowl of iced water for 10 min. In a small saucepan heat slowly 3 tbsp cherry syrup, turn the heat off, lift the gelatin sheets from the water, wring gently, and whisk in until dissolved. In a separate bowl use an electric whisk to combine soft cheeses with icing sugar and the gelatin syrup mixture, until completely combined. Add 120 g cherries. Form a layer on top of the biscuit base and let set in the freezer for 1 hour. Finally, place 230 g cherries into a saucepan, add sugar, 3 tbsp cherry syrup and 2 tbsp water. Stir over medium heat without bringing to boil. Remove from the heat. Add 8 g gelatin (soaked beforehand in the iced water and then wringed out), stir just until the gelatin dissolves. Let cool at room temperature. Tip the mix on top of the cake, smooth over the top, and refrigerate until firm, at least 4 hours. To serve, remove from tin, decorate with some cherries and mint leaves.